Ouch that looks so painful!! But it appears the surgeon did an excellent job! Get well soon JSM!! If I ever need plastic surgery I want JSM's doctor. Still keeping you in my prayers. You and me both 4Donks. Even seeing the pictures before and after. I can't figure out how he did it. Amazing job. I am with you 4D. They did an amazing job. Wow, amazing job! 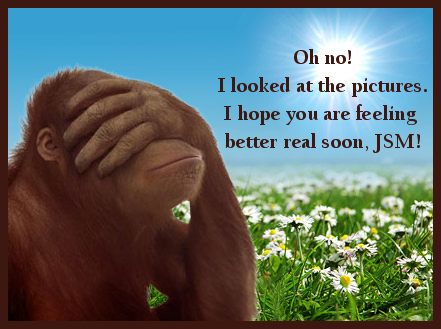 Get well soon JSM! Hope CC can take a few days off to take care of you! good job by the surgeon! hope it's not throbbing too much today! 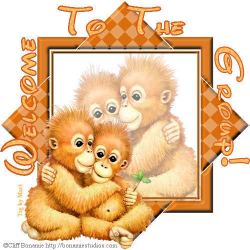 Sending a monkey hug to JSM. Courtesy of Brandi, who gleaned it, from, Grandma Monkey. JSM...your injury is worse than I imagined it would be! you poor girl..that must have hurt so bad...you are very brave..it must have been so painful!! bless your heart..you are a trouper! it looks wonderful now though! what a fantastic job your doc did! bravo on the doc who fixed your lip! what a fantastic job! I am so impressed with the after picture, though! You are so lucky you had such a skilled surgeon, JSM! I still can't figure out how he made lips for you, but you are going to look beautiful again! I wish you a fast and painless recovery. I hope he gave you some good stuff to keep the pain down while you heal. I had a colonoscopy on friday...they gave me some drugs and I do not remember a thing! the nurse said, I am going to put such and such in your iv....that is all I remember!!!! I have never been put out or drugged before so I had no idea what to expect..
hubs said that as soon as I came to, I said, do I have my lipstick on? sooooo funny...THat is totally me but I don't remember it! Isn't it amazing Brandi. I can't figure it out either. Good for you getting a colonoscopy. ...and I assume it was good you got those drugs for it! Good for you Cookie. They have come a long way since I had to take my grandmother for one years ago. I have had one and I didn't get knocked out. Not something I want to do again. LOL I know when my son has his he says the funniest things afterwards and has no memory.